Marie Antoinette creates another piece of jewelry in between customers. We didn’t know what to expect as we pulled into the parking lot at Occooquan Elementary School to set up for their craft fair. 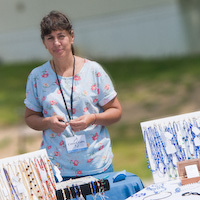 The morning was cool as we set up our bead jewelry stand in the back parking lot on Saturday, May 7th. The customer traffic was a bit slow considering it was such a nice day but it picked up near lunch time. There was plenty of room for more vendors and I think there may be more next year because I can see this event growing rapidly in the future. “I enjoyed the day and met some very nice customers and made some new friends with other vendors. I was very happy to have had the opportunity to participate in this craft fair and I look forward to doing it again next time.” said Marie Antoinette Gilvey. Next weekend, May 14th, CorseCrafts will be in Fredericksburg for the Childrens Miracle Network Craft Show.